Remember a few months ago we announced that we were interested in acquisitions? Well, things are happening. I'm happy to announce that this November we'll add a really great new dice game to our catalog. Chupacabra: Survive the Night, originally published by Haywire Group, will appear in a Zombie Dice-style package in November! You can read our press release for details, or jump straight to the official webpage for more info. Steve, Paul Chapman, and I got to play Chupacabra: Survive the Night just before it was released, and we really like it. We couldn't pass up the chance to add it to our line! 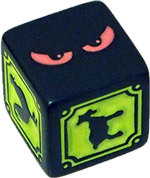 It fits perfectly with our other dice games, especially Zombie Dice and Cthulhu Dice. Thank you to everyone at Haywire Group for working with us to make this happen, and thanks to all of you for supporting us and putting us in a position to take on and publish more and more awesome games. PS: If you aren't from the Southwest, here's where you can learn more about the spooky Chupacabra.